grandma's cookie jar: I Have a Winner! 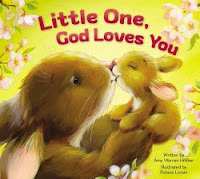 I'm very happy to announce Tina is the winner of one Little One, God Loves You book (you'll find my review at this link)! Thank you Tina for reading grandma's cookie jar (please email me at lyndagcj@gmail.com by February 23, 2016 to let me know your address, so I can have it sent to you!) and thank you Zonderkidz for sending one for me to review and for making another available for me to give away! grandma's chuckles - Snow Duck Man of Doom! crafting with grandma - Butterflies! My Grandma "Instruction" Book . . .
crafting with grandma . . . Blarney Stones! Your Invitation . . . Please Join the Coalition! I Have a Winner & Another Giveaway in Three Days! just for fun . . . Frozen Science Fun! just for fun - It Is Doodle Day!